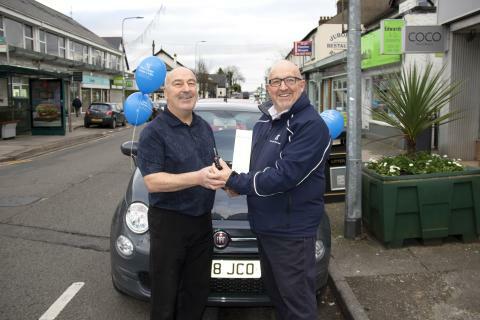 A Cardiff travel agent is now the proud owner of a brand new Fiat 500 after being named the winner of the inaugural ‘Big Fred. Olsen Giveaway’ incentive. 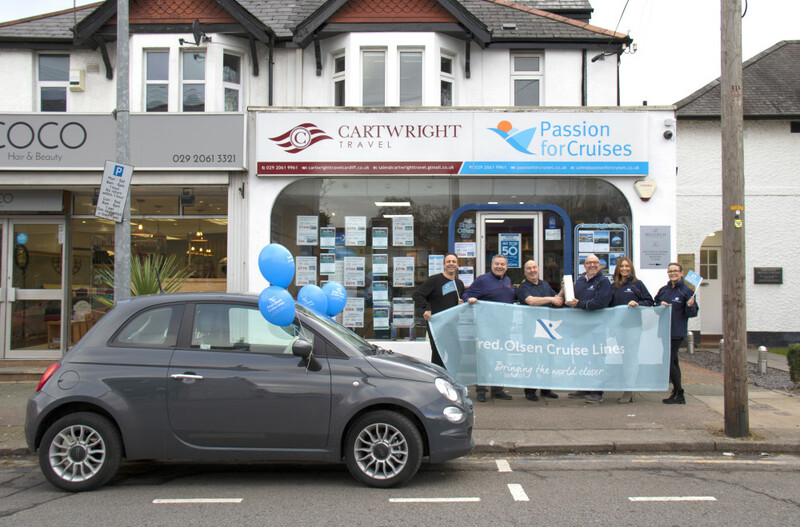 Travel agent Phil Jones, of Cardiff-based Cartwright Travel and Passion for Cruises, was announced as the winner in December, and was officially presented with his new car by Fred. Olsen Cruise Lines Head of Sales, Mike Evans, last week. “I would really like to say thank you to Fred. Olsen. It’s a national draw, so to have your name pulled out is something you never expect, but I’m so glad it’s happened to me! “The news came on a telephone call and you could have knocked me down with a feather. I put it onto loudspeaker so my wife could hear, and I’m quite sure she would have jumped for joy if she hadn’t just had hip surgery! As soon as she’s more mobile we will be going straight out, I can tell you that now, for some nice runs around the South Wales coast. “We had over 4,500 entries in our inaugural ‘Big Fred. Olsen Giveaway’, so it was our biggest promotion ever, and it was great to be able to pull the winner out just in time for Christmas. “I was really looking forward to handing over the keys to Phil and to meeting all of his team. It was a great occasion for Fred. Olsen as well as Cartwright Travel and Passion for Cruises. “Incentives such as this go a long way to rewarding our travel agents for all of their hard work and dedication throughout the year, and it was a pleasure to be able to personally deliver the car to Phil. The Big Fred. Olsen Giveaway, launched at Fred. 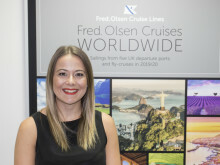 Olsen’s inaugural ‘Closer’ Trade Conference in May, gave UK travel agents the chance to win a car simply by making a booking with Fred. Olsen Cruise Lines. All agents had to do was register every booking they made between 1st June and 14th December – with each booking counting as a new entry into the draw. In addition, the company has also given away a Fred. Olsen cruise for two every month since June as part of the incentive, with the final winner to be announced in January. The winners so far include: Andrea Dixon of Broads Travel, Sutton Coldfield; Lynn Threadkell of ROL Cruise Ltd, Colchester; Justine Wakenshaw of Broadway Travel, Luton; Katie Jones of Holywell Travel, Holywell; Jennie Kidd of Crosskeys Travel, Folkestone; Linda Thompson of Connoisseur Travel, Edinburgh; and Stacey Fuller of Bolsover Cruise Club, Chesterfield.